We are dedicated to our hard work and culture in rendering true service to our clients. This has contributed to our success. With years of providing service solutions for LED televisions in Tirupur region, we have a huge and loyal client base who keep us going forward. We keep ourselves updated with the latest technology testing equipment to deliver the best service. As a convenience to our customers, we have kept single window communication for service and support. Our professional team of service engineers will be at your doorstep when we get a service order lodges with our team. We have genuine spare parts for all major brands of LED TV. AB Service aims at providing best repair service for all major LED TV brands. Our services are available for both domestic as well as commercial usage. We maintain a team of expert service engineers capable of handling any type of repairing service in LED TV. LED TV Customer Feedback Videos! Our engineers are capable of handling task right from television installation. They carry all the necessary accessories to repair and service your television. We undertake electrical wiring services, services of cable and wire harnessing too. We have a one-stop solution for repairs for all brands of televisions. To ensure that your products do not malfunction, we offer periodic services and maintenance check-ups and we also offer tips for optimal use of LED televisions. We are here to undertake all domestic and commercial services at any time. 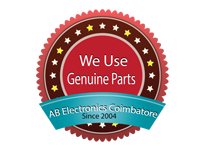 We offer our quality repair services in Coimbatore and Pollachi region. We are here to help you by attending your service call in the shortest possible time.